Hilton Head Christian Academy had a new headmaster who came from the Lone Star State of Texas – where everything is bigger – with a big idea of his own. He wanted to grow the school. He understood the value of a brand and knew the ultimate benefits that come with progressive marketing. He wanted all of the above, so he called us. WDM was hired to develop a professional campaign that elevated the HHCA brand and highlighted the fact that although the school graduated more than its share of National Honor Society seniors and fielded some really strong ball teams, its most fundamental differentiator was Jesus. 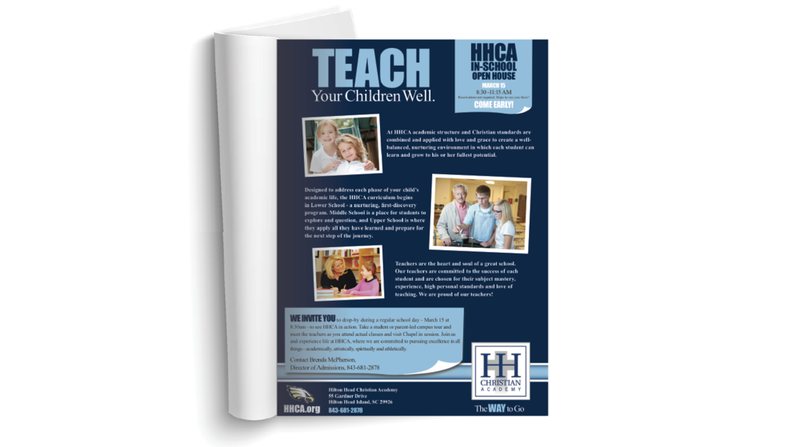 The challenge: to tell the HHCA story in a manner that wasn’t preachy.